What is nutritional yeast made out of? 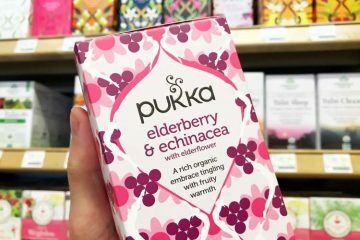 Where to buy and which brand is best? 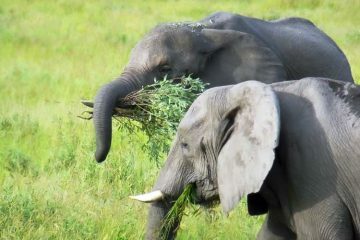 Among vegans, it’s practically considered an essential food. Among average Americans, it’s a foreign food. They don’t know what it’s made out of or how it’s used. Well here’s everything you need to know about it. The ways nutritional yeast is good for you, based on actual science and clinical studies, as well as the potential dangers or side effects. Yeast is a single-celled fungus which feeds on sugar (carbohydrates). Nutritional yeast refers to varieties specifically grown for human consumption. Usually it’s made from a strain of Saccharomyces cerevisiae. Unlike baker’s yeast and brewer’s yeast which are both living, nutritional yeast has been deactivated (killed). Its main health benefit is being a rich source of B vitamins and minerals, and hence, its name. Since nutritional yeast is not living, it can’t cause or worsen yeast infections such as Candida albicans overgrowth. Even though some sources allege that danger, there isn’t science to support it. At least if one is talking about standard nutritional yeast, which only consists of dead fungi. What’s nooch? It’s another name for nutritional yeast. The most common nickname. 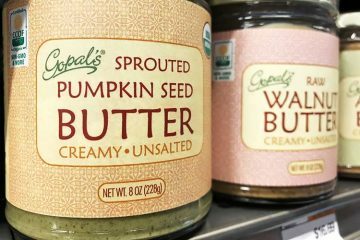 It’s particularly popular among vegans and those who eat it regularly. 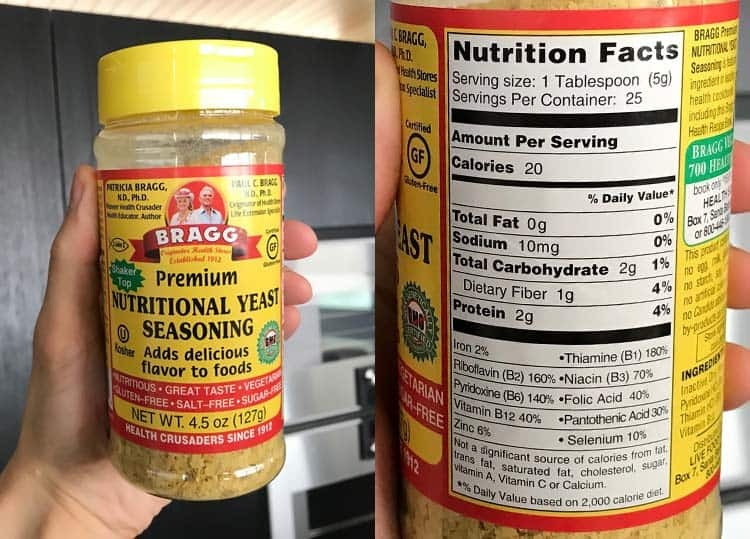 A one tablespoon serving of nutritional yeast is 20 calories, with 0g of fat, 1g of carbs, 1g of fiber, and 2g of protein. It provides over 100% of the daily value for the vitamins thiamine (B1), riboflavin (B2), and pyridoxine (B6). Roughly half the daily value for niacin (B3), pantothenic acid (B5), folic acid (B9), and cobalamin (B12). The minerals zinc, selenium, and iron are 10% or less of RDA. 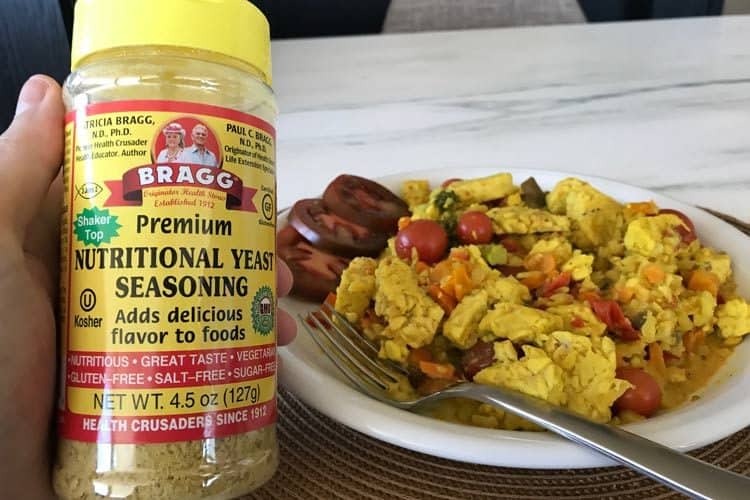 Bragg is the bestselling brand and their nutrition facts are fairly typical for nutritional yeast flakes. KAL and Red Star, which are almost as popular, have a higher concentrations for most of the B vitamins, however that’s due to extra fortification. 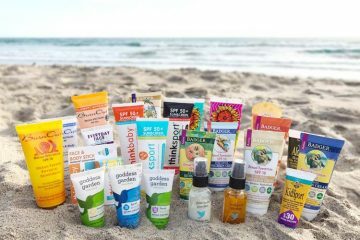 All of these brands are dairy free, egg free, sugar free, and gluten free. Bragg and Red Star are kosher. 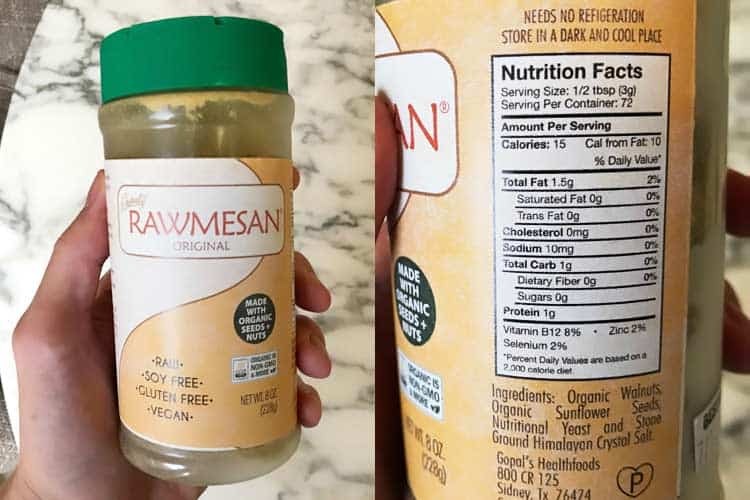 While it’s commonly cited as a good vegan source, the amount of vitamin B12 in nutritional yeast is naturally zero. Bragg, Red Star, Bob’s Red Mill, KAL, Trader Joe’s, and most other brands only contain B12 because they add it. The typical amount added leads to each tablespoon providing 50-150% of the daily value. What is nutritional yeast good for? The B vitamins are its biggest nutritional benefit, while the cheese-like flavor are its most prized quality for cooking and recipes. Nutritional yeast tastes nutty and cheesy. When you add moisture to the dry flakes, they even have a creamy texture like cheese. It’s a strong flavor that’s somewhat pungent, which is why not everyone likes it as a stand-alone. Some people say it doesn’t taste exactly like cheese, which is true. If you want to replicate dairy as close as possible, the trick is to use nooch in combination with other plant-based ingredients, like pureed soaked cashews or almonds. This seasoning with a little sweet potato in mac ‘n cheese works wonders. Even though it’s from fortification, it’s still noteworthy because there aren’t many vegan B12 food sources. Is Daiya plant-based cheese healthy? It’s cholesterol free unlike real cheese and it is healthier on a relative basis, but it’s not healthy. Daiya is almost all fat and not the healthy types. 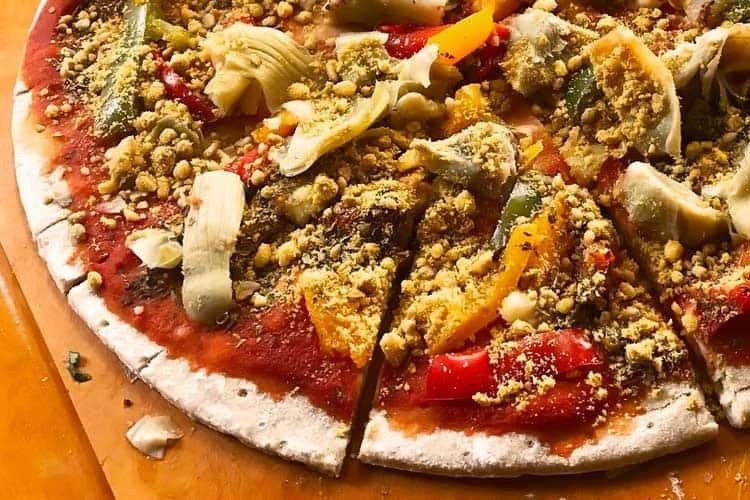 Nut and nutritional yeast based vegan cheeses are better for you; higher protein content and healthier fats. Our favorite is Gopal’s Rawmesan. Keep in mind that 1g of protein per 15 calories equals around 7g per 100 calorie serving. That actually beats real cheese made from cow milk. Gopal’s is high protein and very low sodium, the latter of which is an advantage that real cheese and Daiya don’t offer. You can buy Gopal’s on Amazon. Protein is 4 calories per gram. There are 2g per serving, which means 8 of the 20 calories in Bragg nooch flakes are in the form of protein. 2g of protein may not seem like much, but remember that’s for just one tablespoon. If you’re on a plant-based or dairy-free diet, you may be using several tablespoons (or more) to flavor mac ‘n cheese, popcorn, pizza, tacos, and pasta. Think about it… if you add 5 tablespoons, that’s 10g of protein and is just 100 calories. We used it to top this gluten free cauliflower crust pizza. Nutritional yeast has no added salt and its natural sodium content is 10 mg per tablespoon. That’s below 1% of the daily value. Because its pungent cheese-like taste is so strong, it’s a major flavor booster for almost anything you sprinkle it on… while adding almost no sodium in the process. There are a few hot sauce brands without salt added. Except for those, practically all condiments are sodium bombs. Ketchup, mustard, soy sauce, you name it… they all have high amounts of salt. Instead of salt, try sprinkling some nutritional yeast on popcorn. The 1g of fiber per tablespoon seems trivial, but if you’re eating 4 or 5 of them, that equates to being 20-25% of the recommended daily value. What’s real special though is the type of fiber it contains. If you live in the Midwest and suffer from seasonal allergies, pay attention. The University of Michigan conducted a 12-week randomized, double-blinded, and placebo-controlled clinical trial using nutritional yeast. 96 people with seasonal allergies, who were otherwise healthy, were given a supplement or a placebo to take for 12 weeks during peak pollen season. Those taking nooch had fewer and less severe allergy symptoms, apparently due to immune modulating effects from it. In addition to suffering fewer days, the severity of nasal congestion, runny nose, sneezing, watery eyes, and other symptoms were lower vs. placebo. Embria Health Sciences sells this version, branded as EpiCor, and you can get it on Amazon. 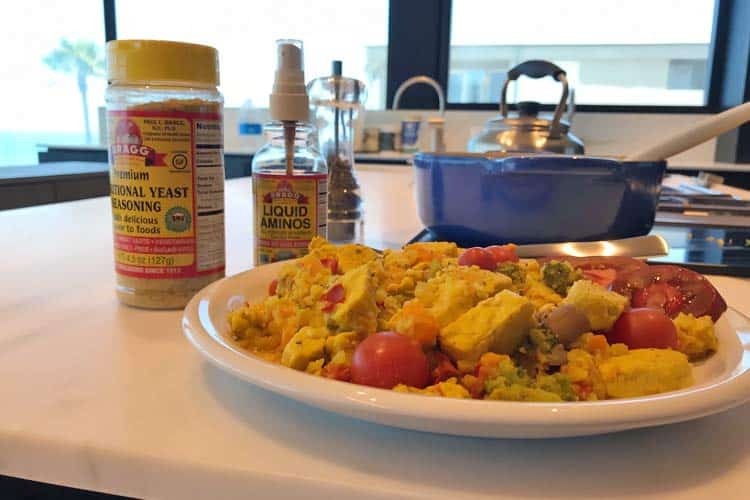 Not one, but two double-blinded and placebo-controlled studies have been published to date which suggest that nutritional yeast may help with cold and flu side effects. In that study, everyone had received the flu vaccine. Similar positive results were seen in a concurrent trial of the same size involving non-vaccinated participants. It may not be the exact same thing as EpiCor but the German brand Perenterol sounds quite similar. It’s 250 mg capsules of a dried Saccharomyces cerevisiae dosage. It was used in a randomized, placebo-controlled, and double-blinded clinical trial involving 139 patients with acne. They took it for 5 months. Interleukins are a type of cytokine (signaling molecule) which are used by the immune system. They signal white blood cells. In short, interleukins tell the immune system to act! During strenuous exercise, like intense bodybuilding and long-distance running, it’s been well documented that immune system performance drops. This is most likely due to the fact that the body has to struggle with the stress of the fitness. Only so much resource can be allocated to maintaining basic immune function. As published in the prestigious British Journal of Nutrition, researchers at the The University of Houston tested a branded source of yeast (Wellmune WGP) on athletes. They called it baker’s yeast but it’s same species found in nutritional yeast (S. cerevisiae). Both are actually the same thing, the only difference is that one is dead (nutritional) and one is living (baker’s). In this case, they probably should have called it nutritional rather than bakers, because it was dead. 60 athletic men and women completed two trials using this yeast or a placebo (rice flour). There was a 7-day washout period between each trial. 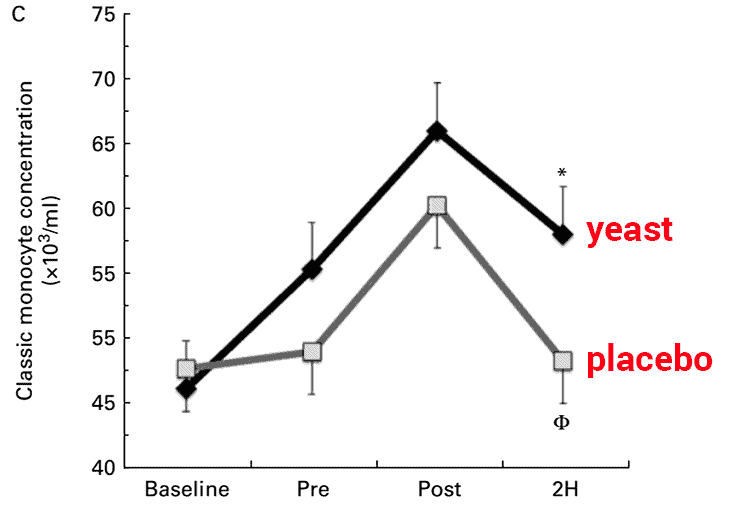 The supplement or placebo was taken during the 10 days leading up to each fitness test. That test was a one hour cycling course in extreme heat (38°C or 100°F) and high humidity. 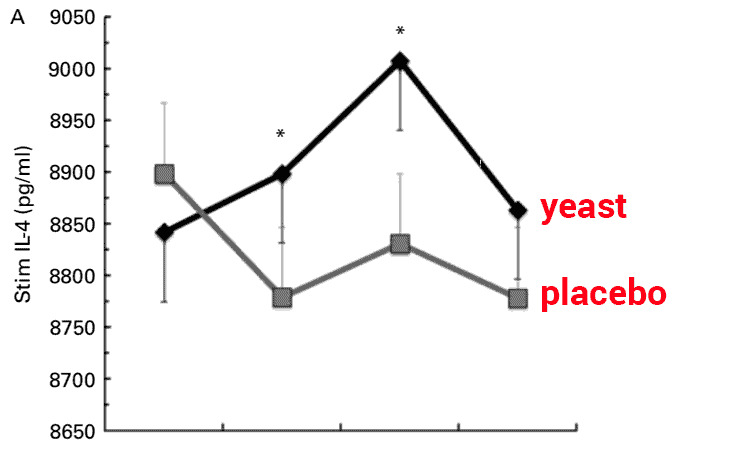 When they were supplementing for 10 days prior with the yeast, they had higher monocyte concentrations. They also had higher interleukin counts of IL-2, IL-4, IL-5 and interferon-y (IFN-y) at pre and post-workout. The amount of antioxidants in nutritional yeast is limited. While rich in B vitamins, those aren’t known for having antioxidant activity. Vitamins C and E are do but nooch doesn’t contain any. What it does have is selenomethionine, which is a naturally occurring amino acid containing selenium. In some scenarios, selenomethionine acts as an antioxidant. That fact, along with the other unknown active ingredients in nutrition yeast which appear to support immunity, may boost the body’s internal production of antioxidants, such as superoxide dismutase. 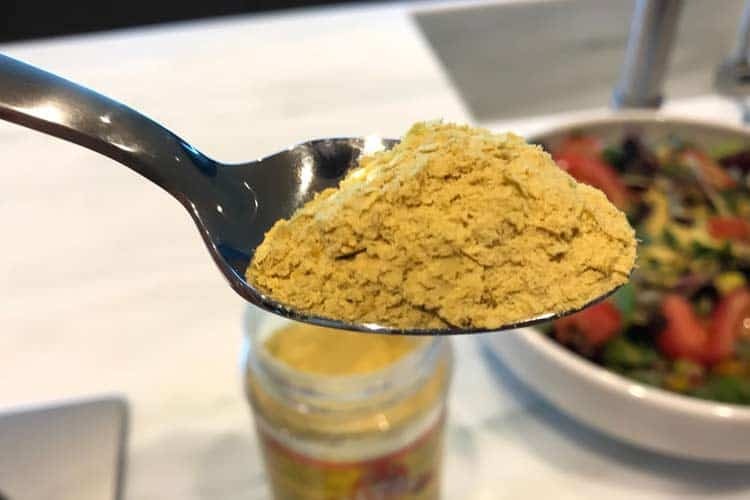 While normally considered a health benefit, the ramping up of the immune system – as reported by multiple studies – suggests that nutritional yeast may be bad for you if you suffer from an autoimmune disease. Rheumatoid arthritis, lupus, and multiple sclerosis (MS) are examples where higher immune system activity may have an adverse effect on health. Nutritional yeast can’t give you a yeast infection, since the yeast is dead. With raw brewers and baking yeast, there is a risk of infection. 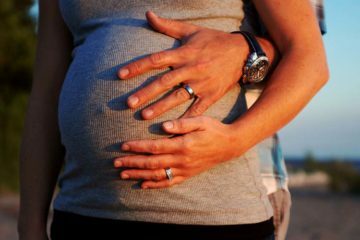 Whether dead or alive, this species is totally different than Candida albicans and therefore, none of them can directly worsen Candida yeast infections. In California, a warning label is required on foods and supplements if they contain more than 0.5 micrograms of lead per daily serving. All of these are less than the California Prop 65 disclosure requirement, though it is interesting to see that some brands have detectable levels of lead. For those eating several servings per day, this is a potential danger to be aware of. In that case, the cumulative amount of lead would be high enough to trigger a CA Prop 65 warning. However since the nutrition facts label only lists one serving per day, it doesn’t. Given the findings of Dr. Gregor’s lead tests, you should choose one of the brands which had no detectable lead levels. Those were Bragg, Bob’s Red Mill, Dr. Fuhrman, NOW Foods, and Red Star. Among them, our favorite nooch brand is Bragg. Along with Red Star, it has the longest history for being sold as a food or supplement. It’s made in the USA and provides high amounts of essential B vitamins, including B12 which can elusive to vegans and vegetarians. Here we used it to flavor a turmeric tempeh scramble for breakfast. At our local Whole Foods store, even though they have a large display for Bragg apple cider vinegar, they don’t carry their nooch. Instead they have KAL and Whole Foods brand. That said, inventory varies by location and you may be able to find it at your local Whole Foods, as well as most vitamin and health food stores/co-ops. 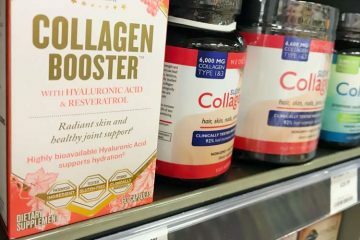 Walmart stocks Red Star nutritional yeast flakes in a shaker at some locations. On Amazon you can get the popular 4.5 oz shaker of Bragg flakes.